Following our hiring and promotion news in April, we're excited to announce that our team has expanded again to include two engineers, and a marketer. Demand for software is growing and we're doubling down on delivering quality solutions for our clients. To continue building on this momentum we're growing our engineering team, and establishing a marketing team. "As we grow our engineering team, and its capabilities, it's also necessary to expand our business team to keep the organization healthy," said Casey Kinsey, President of Lofty Labs. "We're adding positions across the board to meet demand, including creating a brand new division with our marketing team headed by Josie. We talk a lot about year-over-year growth, but the bigger story here is that we've tripled our head count in just 12 calendar months." 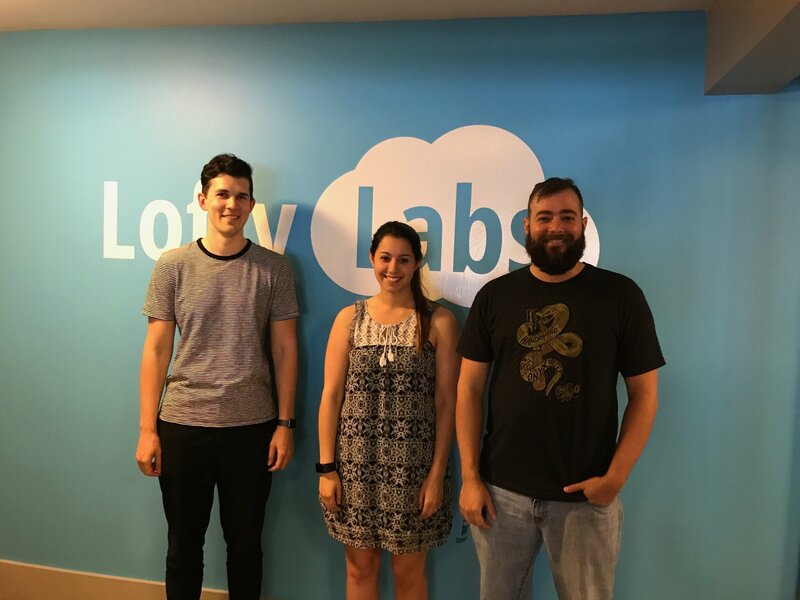 It's vital for a small business like Lofty Labs to find motivated people who can build on the foundation set by the original team. "It’s usually pretty hard to find engineers in our region," said Addam Hardy, Director of Engineering, "I think we got really lucky this time finding two that are not only motivated and good at what they do, but fit in very well with our team." Hayden fills the position of Software Engineer II, and will be contributing to project planning, system architecture design and development. Before joining Lofty Labs, he worked at Collective Bias developing their influencer marketing platform, Social Fabric. Hayden has also volunteered at GiveCamp NWA where he spent a weekend with other area tech professionals helping a local non-profit develop a website using Wordpress. He is used to working with large amounts of social data, and is very excited to join the Lofty team. Hayden received his B.A. in Computer Science from the University of Arkansas College of Engineering in 2015. In his free time he enjoys listening to music, drinking coffee, eating burritos, and trying to lift heavy things in the gym. Alan Fraley joins the Lofty Labs team as Site Reliability Engineer. Alan graduated from Northwest Technical Institute, where he studied Information Systems. At NTI he gained hands-on experience with network protocols, servers, databases and software design, which are valuable DevOps skills. Before joining the team at Lofty Labs, he worked at Arvest as a Service Desk Technician, where he supported approximately 300 different software applications. Alan is a self taught musician who has enjoyed sharing music with Northwest Arkansas for many years and has had the privilege of playing along side some of the greatest musicians in the area. His diverse experience, knowledge and curiosity are a welcome extension to the Lofty Labs engineering team. Josephine recently joined the team as the Director of Marketing. She is a writer, and Hubspot-certified inbound marketer, who specializes in building brand awareness, and generating marketing qualified leads for small businesses, and startups. Before joining Lofty Labs, Josephine was the Director of Marketing at Acorn, The Influence Company, and the Marketing Manager at Fayetteville-based startup, DataRank (acquired by Simply Measured in 2015). She also founded her own marketing consulting company, InboundMate, where she helps startups learn about bootstrapped marketing. As Director of Marketing, Josephine will be leading the marketing efforts for Lofty Labs, and making an impact on the company's brand, messaging, and sales. Along with creating content, and hosting company events, she will be responsible for all PR, social, and lead generation efforts. Josephine holds a Bachelor degree in English Literature, and Creative Writing from the University of Melbourne, Australia. She is also a volunteer at the 2017 NWA Tech Fest, and regularly attends startup events in the Northwest Arkansas tech community.